Next review LeafFilter North - It works great! Sep 05, 2016 LeafFilter has an industry-leading lifetime, transferable warranty – the best in the business. We offer a 100% money back no-clog guarantee. If you are having issues with LeafFilter, please feel free to reach out to our dedicated service and support team at 800-749-4566. Full disclosure, this post is from a competitor who thinks consumers should research what they are buying. Check the warranty. Leaffilter guarantees that the interior of your gutters will not clog but offers no guarantee that their screen will not clog. Their product completely covers your gutter. Of course nothing will clog the interior...it's covered by the screen. But when the screen clogs (as many complaints indicate) then water will run over. 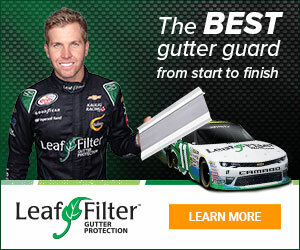 Leaffilter claims to be the #1 rated gutter guard by Consumer Reports. Look it up yourself. Google "consumer reports gutter guards". Gutter Glove was rated substantially higher. And Consumer Reports had negative comments about all pro installed systems. 3. Misleading posts on this site. Leaffilter claims that negative comments are from competitors and that they know this because they "checked the IP addresses." IP addresses are not published with reviews on this site. Another review from Raleigh states that Leaffilter North installed on their home 10 years ago. The company has only done business in Raleigh for 5 years. Someone is posting erroneous reviews on this site to make Leaffilter look better. Bottomline. Buyer beware and please do your research. Review #677201 is a subjective opinion of User677201. You obviously work for "GutterGlove"... nice try. Nice job Sherlock. You busted someone who started their post by writing, "Full disclosure, this post is from a competitor ..."
Gutter Glove, Gutter Helmet, Leaf Guard - who cares who wrote the post as long as the info is accurate. Sounds pretty shady. There do seem to be quite a few "positive" reviews on this site that read fake. The warranty issue seems to be a recurring theme. Probably a good step for consumers to request a copy of the warranty before purchasing. Leaf filter. Make it a great day! Leaffilter sold their product through a dealer for many years in the Raleigh area before opening up their factory store in 2010. This simple fact makes your comment slanderous and deceptive but you already knew that. A truthful comment can never be slanderous or libel. Homeowners can and should research home improvement projects extensively before they make a purchase. So...is everything accurate except for a couple of dates? Jeez, the warranty and consumer reports issue seems huge. Is the only rebuttal a couple of dates?!?! I'll just pay a hundred bucks to have my gutters cleaned.